I would like to thank Doug Eadie for taking the initiative to create this blog for public transportation CEOs and GMs to exchange ideas and information. Having this valuable dialogue will enhance our ability to network with each other and share best practices. 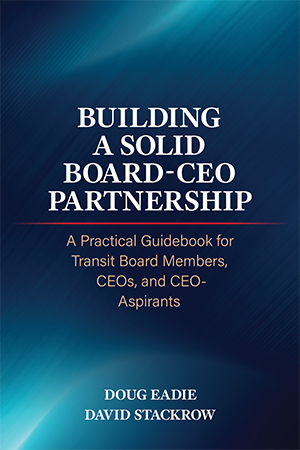 The key to a transit authority’s success is having a collaborative working relationship between the CEO/GM and board of directors. We must also commit to board development. I am honored to be part of this distinguished advisory group and look forward to sharing insights as a guest contributor to the Board Savvy Transit CEO blog.